To the novice cook making a homemade lasagne can be a very daunting experience. The easiest way would be to purchase jars of ready-made tomato and cheese sauce and just fry a little mince but with a bit of planning you can soon prepare a tasty family lasagne that will become a firm favourite. Why not make a larger portion and freeze ready for an evening when you are home late from work and fancy a home cooked meal? Freezing in portions is also ideal for when only one or two members of the family are home for dinner. Heat the oil and fry the onion until clear. Add the mince and cook until brown. Add the chopped carrot, crushed garlic, red pepper and herbs. When the carrots are soft add the can of tomatoes and the red wine and leave to simmer for twenty minutes or until the meat and vegetables are tender. At this point add the chopped courgette and sliced mushrooms and enough tomato paste to make a thick sauce. Season to taste. Whilst the sauce is cooking bring the milk to simmering point but do not allow it to boil. In a separate pan add the flour and butter and heat through until the butter has melted and formed a paste. Gradually add the hot milk stirring all the while until you have a thick sauce. If the sauce is not very thick add small balls of butter and flour until a good thickness is reached. Add the cheeses and nutmeg and mix well. Spoon a third of the meat sauce into a heatproof dish. Cover with a layer of lasagne sheets followed by a third of the cheese sauce. Repeat this three times ending with a layer of cheese sauce. 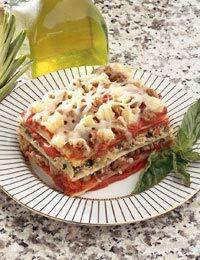 Decorate with the sliced tomato and a scattering of grated cheese held back from the sauce mix. Place the dish onto a baking sheet and bake in the centre of the oven for thirty minutes or until a knife can cut through the pasta easily. Do not over fill the heatproof dish or the sauce will overspill. This meal is best cooked with both sauces as thick as possible otherwise they tend to bleed into each other and make a sloppy mess. Serve with a green salad and garlic bread for a tasty satisfying meal.